Ms Hoey also revealed plans to join forces with former Ukip leader Nigel Farage to campaign against Prime Minister Theresa May’s much-criticised Chequers blueprint setting out her vision of Britain’s relationship with the bloc after March 29, 2019. She said both Mr Corbyn and shadow chancellor Mr McDonnell were enthusiastic leavers, adding: “I’m delighted. Ms Hoey stressed the importance of achieving a much-vaunted “Canada +++” deal with the EU rather than Mrs May’s Chequers proposals, which is widely seen by Leavers as keeping the UK too closely tied to Brussels. Some Remainers, including many MPs, continued to characterise those who voted Leave as motivated by racism, and believed they would eventually change their minds, Mrs Hoey said, attitudes she described as “complete rubbish”. Mrs Hoey, one of a handful of Labour MPs who have consistently voted with the Government when it comes to Brexit legislation, is facing deselection from her Vauxhall seat as a result of her persistent defiance. And in an indication of her maverick tendencies, she is planning to team up with Mr Farage at a Leave Means Leave rally in Bolton on September 22 which will seek to take a wrecking ball to Mrs May’s Chequers plans. She said: “I have absolutely no objection to Nigel being involved. “I’ve seen him at rallies. I know that people come out to hear him. “He’s a very, very good orator. Mr Corbyn’s lukewarm attitude towards staying in the EU was noted during the 2016 referendum campaign. Prior to this he was a frequent critic of Brussels. He described the Maastricht Treaty of 1993, which established the European Union as an entity and pushed for greater economic and political union as “taking away from national parliaments the power to set economic policy and hands it over to an unelected set of bankers”. However, he currently favours the UK remaining in a customs union with the EU, in order to retain tariff-free access to the bloc. 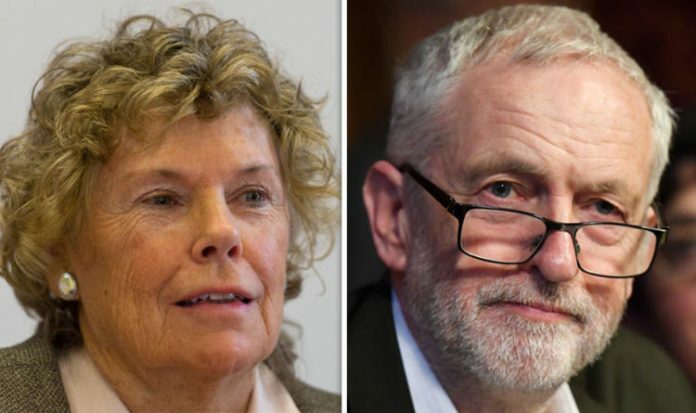 Earlier this year former Labour Prime Minister Tony Blair – who appointed Ms Hoey Minister for Sport in 1999 – claimed his party would pay the price for Mr Corbyn’s “closet Euro-scepticism”. In an article written to coincide with a report on Brexit and customs prepared by his think tank, the Tony Blair Insitute for Global Change, he said: “The Remainers, however, have now cottoned on to the fact Labour is not really for remaining either, except in the very limited sense of the Customs Union, and so, unsurprisingly, they’re losing faith in Labour as a route to avoid Brexit. “The Labour Party will pay a heavy price for the leadership’s closet Euro-scepticism.